Charles Proctor is behind the groom, possibly the best man. At the right are the bride’s parents Billy and Julia Proctor. Despite the 1942 date, no-one in the wedding photo is in military uniform. This photo comes from my grand-mother’s collection. Another photo from the same collection depicts the Proctor family including 2 sons in uniform, clearly dates from World War II. Back row: Edward Earnest (Ted), Ivy Rose, Charles, Mabel and William Herbert Proctor. Front row: George, Albert Herbert (Billy), Julia Ann, Frank and Violet Lena (Honour) Proctor. Notice that the mother of the bride, Julia Ann Proctor (nee Coulson) is wearing the same dress in both photos. This could suggest that the photos were taken around the same time, but clothes rationing during the war could have caused Julia to keep her dress for several years. On checking the marriage index, I confirmed the marriage occurred in the October – December quarter of 1942 in the Gipping registration district and provides middle initials of M for Mabel and R for George. Although it is difficult to estimate the age of people based on a photo, George looks like he was aged between 20 and 40, so would most likely have been eligible for military conscription. The best fit in the birth index is for a George R Cobbold in January-March 1914 in the Cosford registration district, which would make George about 29. Possible reasons why George was not in uniform include personal choice, being in a reserved occupation, conscientious objection to military service, and health conditions. Wondering which occupations were reserved but not having found a reliable reference online, I posted a question on the recently established Genealogy and Family History Q&A website on StackExchange. A prompt answer lead me to an article in The Times , and provided a reference at The National Archives (LAB25/97). The Times Digital Archive 1785-2006 is available through academic institutions and libraries. Service In War. The Times (London, England), Wednesday, Jan 25, 1939; pg. 6; Issue 48212. Lovely to see those much loved and so familiar faces – all gone now! The first photo is of my aunt & uncles wedding. 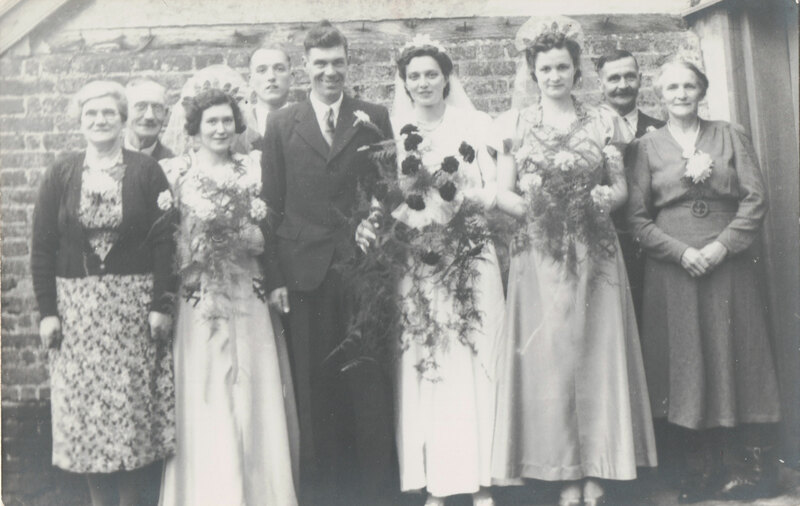 Next to grandma & grandad is my aunt Violet Proctor (known as Honour) as bridesmaid. The other bridesmaid I don’t know, next to her are Mr & Mrs Cobbald George’s mum & dad. Standing behind is my uncle Charles (Charlie) Proctor (best man). George Cobbald didn’t get called up as he was in “reserved occupation”. 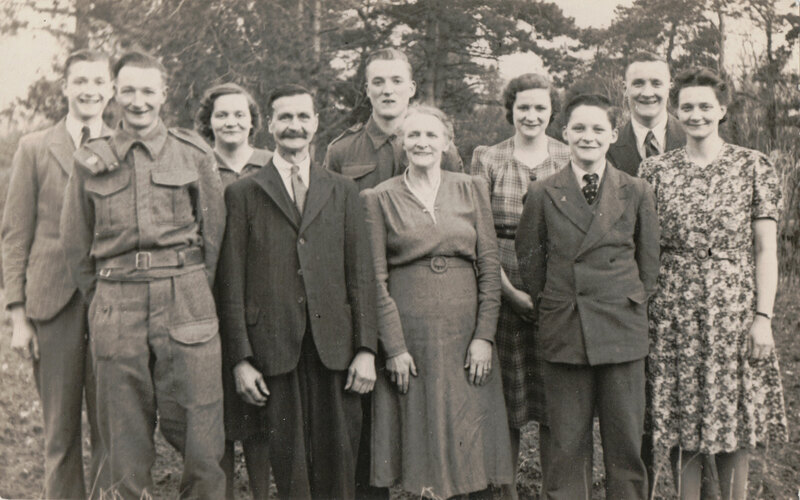 The second photo is one of the whole Proctor family – from left to right my dad Edward Proctor, Will Proctor, Ivy Proctor, my granddad Billy Proctor, Charles Proctor, my grandma Julia Proctor, Violet Proctor (Honour), Frank Proctor, George Proctor and Mabel Proctor. My dad Edward joined up early (17.5yrs – shortly after this photo was taken) Will was in the home guard (reserved occupation), Charlie was in the army, George was reserved occupation and Frank was too young to join up. Thanks for confirming the identities of the people. Do you know where George and Mabel were married? Thanks for identifying the location of this marriage. Do you have the marriage certificate, or do you know this by some other means? I’m a genealogist, expect me to ask you to cite your sources ;-). Hi, Are these the Proctors from Wymondham? If they are then William Herbert Proctor is my great-grandfather. The Proctor family featured in the blog post are associated with locations in Suffolk. William Herbert Proctor was born in 1908 in Hitcham, Suffolk and other members of the family lived in the Gipping and Cosford registration districts, also in Suffolk. Other than his place of birth, I have not traced William Herbert Proctor, so don’t know if he moved away from his place of birth. Wymondham is in Norfolk, a county that adjoins Suffolk. When enquiring about an ancestor it is helpful if you include information such as dates and places of birth, marriage and death, as well as a name, so that your ancestor can be distinguished from other people who share the same name.